No joy for whisky drinkers - thanks PLCB. First we had the Pappy Van Winkle debacle, where the PLCB didn't know that when you have a monopoly on a product that is in very high demand for that product, and you tell everybody all at once that the product is available...there will be a rush to get said product. It seems nobody in Harrisburg went to business school or understands basic demand. Now we have the picks for the top malt whiskies of the year being released, and like with the wine lists that I chronicled on the blog starting back on Nov, 11th, it doesn't look good for PA.
Top Speyside Single Malt - Craigellachie 17 - NOT AVAILABLE IN PA.
Top Islay Single Malt - Signatory 1998 bottling of Laphroaig - NOT AVAILABLE IN PA.
Top Lowlands/Campbeltown Single Malt - Rosebank 21 - NOT AVAILABLE IN PA.
Top World Whisky - Broger Burn Out - While also not available in PA, they get a pass, since I can't find it anywhere in the U.S. The PLCB slogan should be - "Only the rest, never the best"
Selling Allocated Van Winkle Whiskeys Online is the "Most Fair" Method. Really? Stacey Kreideman, the PLCB's spokesperson, told us that the most "fair" way for the agency to sell their allotment of relatively rare and highly desired Pappy Van Winkle whiskeys was to put them up for sale all at once, online, with no warning but an email to say "We got 'em, time to buy!" So let's look at how much, if any, thought was put into that statement. After all the PLCB has to serve ALL the population: we can't legally go anywhere else. Pennsylvania's population is about 12.9 million. Of that about 3 million are under 21, leaving 9.9 million adults who can legally buy liquor. About 800,000 people work in non-management manufacturing, mining, and construction, mostly during the day, so they aren't -- can't be! -- looking to get twitter blasts in the middle of the work day. That takes our number down to 9.1 million who may have the time, internet connection, and desire to buy a bottle on line. Health Services is another large employer with about 1.2 million employees. Take out the night shift, and the administrators and other desk jockeys, and that is near 800,000 who are actually at work doing something when the PLCB sends out it's email blast. Down to 4.9 million now: half of the population that will never get a shot at the PLCB's rigged Van Winkle race. Drop another 500,000 for Leisure and Hospitality workers - wait staff, cooks, busboys, hostesses, hotel workers etc., etc. Another 200,000 for government workers like road crews, maintenance, military, police, firemen, state store clerks (they're certainly not checking Twitter; they're too busy shoveling coal into their 1930s-era POS system) and what have you, and at least another 100,000 for non-traditional services, the number drops to 4.1 million or less. So how fair is it when over 60% of your buying population can't buy what you are selling? Putting it all on sale at 5 AM would be far more "fair" to the majority of buyers, since most could actually try to get on the crashing PLCB website. Ahh, but then the PLCB workers in Harrisburg would have to get up early and actually try to do something for the people they work for. Can't have that, now can we? I originally made the following up, as a joke, but it turns out to be more true than I thought. "It's the most fair to everyone that works behind a desk" said the PLCB. "If you have one of those laboring jobs we really don't care about you and you shouldn't be buying $100 bottles of whiskey. Our clerks will tell you so." The PLCB's online 'store' needs a new motto. Here's a proposal: "We don't deal with the public, we make the public deal with us!" A prime example of how the PLCB doesn't work. Just under four months ago I was working on a story and needed to check some information about the District Managers. The PLCB had a webpage for that where all you had to do was click on the county and a pop-up would tell you what district it was in and who the district manager was, at least that is what the instructions said. Great, just what I needed. So I click on the county and .....nothing happens. I try a different one....same thing, nothing happens. So I email the "LB Webmaster" who tells me: "The link below is an outdated page. We will submit this to our IT department for removal from search engines." About 6 hours later I get this message from Stacy Kriedeman, the Director of External Affairs; certainly an acceptable response time. "Here is a current list of our district managers. If you need anything else, please let us know." So, taking her up on the 'if I need anything else,' I reply: "Thank you very much. Will this information no longer be on the website if the page that it was on is going to be removed?" Stacy responds shortly thereafter:"We're looking into it. I don't believe it's on the current public website, but that doesn't mean it can't be added. I just need to do some research and that's going to take a little time.Thanks for your patience." 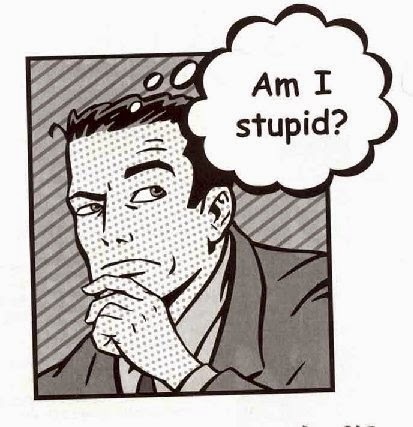 Now I'm thinking - if the webpage isn't on the current public website and I don't have any non-public access, then how did I get to it from the PLCB website? Plus, it doesn't need to be added since it is already there, all they have to do is update it with the information she already sent me. Don't they know what is on their own website? The question is now will they update the website with the information that they have or will they delete it from the public view? So everything is well and good, the page will either be fixed or deleted if I have some patience and she did send me the info I was looking for. So how long will this take I wonder? I check once in a while and finally AFTER 3 MONTHS I send this. "It seems we have a vastly different idea of what "a little time" is. It has been 90 days since I pointed this out and the non-functioning webpage is still non-functioning and still accessible... I'm not entirely sure why the PLCB no longer wants to provide this information to the general public, perhaps you can offer an explanation?" Well, guess what? That next morning, the page was no longer accessible, the information it provided is no longer available, and there was no explanation forthcoming as to why what used to be available to the public was no longer going to be available to the public. Not keeping the public informed is easier, I guess. Just like anything else it seems, the PLCB only does something when pushed, or when their mistakes are pointed out, or when the threat of privatization looms. That is no way to run a state agency and certainly no way to run a business. Rejoice Citizens! Out of 101,000 cases for the Wine Spectators top 25 wines your PLCB managed to secure about 10 of them! In a stunning display of wine buying ineptitude those highly qualified, knowledgeable (so we're told) buyers responsible for satisfying the wants of almost 13 million citizens of the Commonwealth managed to select even fewer of the Wine Spectator top 25 wines this year than last. With numerous private stores across the country doing as well or better one has to wonder how they do it with such limited buying power and no PLCB experts on hand to help them. Without further ado, Wine Spectator's #11-25. 11. Mt. Eden Vineyards Chardonnay Santa Cruz Mountains 2011, 1,692 cases. 12. Château Guiraud Sauternes 2011, 7,000 cases. 13. Fonseca Vintage Port 2011, 2,190 cases. I originally listed this as Not available in PA but if you search for porto instead of port it shows up. My bad. 14. Fontodi Colli della Toscana Centrale Flaccianello 2011, 4,000 cases. 15. Bedrock The Bedrock Heritage Sonoma Valley 2012, 500 cases. 16. Two Hands Shiraz Barossa Valley Bella's Garden 2012, 6,000 cases. 17. Soter Pinot Noir Yamhill-Carlton District Mineral Springs Ranch 2012, 1,500 cases. 18. Château Doisy-Védrines Barsac 2011, 3,500 cases. 19. Luca Malbec Uco Valley 2012, 7,000 cases. 21. Castello di Volpaia Chianti Classico Riserva 2010, 4,000 cases. 22. Podere Sapaio Bolgheri Volpolo 2011, 7,500 cases. 23. St.-Cosme Châteauneuf-du-Pape 2010, 1,300 cases. Hey, we've got some! There were 4 bottles left in the entire state Monday morning. Better hurry...because you know the clerks won't hold them. 24. Massolino Barolo 2009, 3,165 cases. 25. Bodegas y Viñedos O. Fournier Malbec Uco Valley Alfa Crux 2010, 1,250 cases. WWY4 still loves ya, baby. Another in a continuing (as long as Wendell W. Young IV is around) series about the BS that he propagates. On the United Food and Commercial Workers Chapter 1776 webpage, the Union -- under the leadership of President for Life Wendell Young IV -- says that in 2007, PA had the lowest death rate in the country associated with alcohol consumption. Although their link doesn't work (go ahead, click it, ours does), they are actually correct about this....for 2007. By 2009 Pennsylvania's rate had increased over 25% (Page 87 in the report) and by 2012 had gone up even more (Table 19, Page 78), resulting in a rate 30.8% higher than the 2007 figures the union likes to use. If you imply that the union-run, state liquor stores are responsible for the low rate, then aren't they also responsible for the higher rate? Just to make things worse for Wendell, of the states with lower rates than PA for the past seven years, two of them are New Jersey and Maryland. (Damn those free privately-run states right on our border...that so many Pennsylvanians use.) You know what all this means? When Wendell or any of his underlings say that PA has the lowest death rate associated with alcohol consumption and they don't add "back in 2007", they are lying. As president of the PA Wine And Spirits Council, Wendell clearly stands behind the statement when their webpage (which hasn't been updated since 2011; way to stay on top of things, Wendell) says that "State Police investigators have found just two instances in the past six years of wine and spirits shop employees selling alcohol to minors." The only problem (as we pointed out to the state's journalists and legislators back in early 2011) is that the State Police doesn't check the stores for underage sales. NOT AT ALL. So if they "investigated," it was only because somebody else caught them. If you really think that only two underage people bought liquor in a state store from 2004 to 2010, then I have a very nice deal on the Ben Franklin bridge for you: stop by Philly and have a look! Amazing riverside views, and for you, I have a GREAT cash price: today only! The BS continues with the statement that "Pennsylvania has the 7th lowest rate of youth drinking and binge drinking in the nation." No links or proof are offered but it certainly doesn't agree with the numbers from Responsibility.org (page 11) which has PA at a tie for 24th place barely making it into the top half of states with New York, New Jersey, Delaware and Ohio all doing better. In fact, let's look at the Substance Abuse and Mental Health Administration report on Underage Binge Alcohol Use. The picture doesn't get much better. Based on the National Survey of Drug Use and Health it divided the country into 468 substate regions. Pennsylvania was divided into 15 of these substate groups. Of those 15 - 13 were higher for binge drinking then the Mean or Median values placing the state firmly in the upper half for worst underage binge drinking and not 7th best as claimed by Fearless Leader. So there is another one; Wendell lying about safety of children, which he does with some regularity. Have you seen those stupid UFCW commercials that the entire nation laughed at? When you make a statement that can't be proven, then you aren't spinning, you aren't being misheard, you aren't being taken out of context. You are lying. I'm sure that the first few months of next year, once the legislature reconvenes, will provide Mr. Young with more time to practice his lies, which is fine. I'll be watching and waiting with the truth. Remember to write your Representatives and Senators and tell them we want the state out of the alcohol business. Send a note to Governor-elect Wolf too (or Tweet to him @wolfforpa), so he knows this won't go away. The Wine Spectator Top 10 list started to come out this week, and this is another place where the people of PA can see in so many ways that they are not treated as most other citizens are when it comes to having the best available. Today, Friday 11/14 their Number One wine was introduced. The PLCB has managed to score just one of the other top wines so far. #1 - Dow's Vintage Port 2011 - 5,000 cases. The big question is can you buy this in PA? The answer is Yes, 6 stores carry it. Not the availability you can find in MD, NJ or NY but if you hurry you may be able to get one of the 14 bottles in the state. Who would have bet that the PLCB managed to out do itself and get two out of the ten top wines in stock? I know I wouldn't. Although with just 6 stores having it "in stock" is a push. Next week I'll take a look at numbers 11 to 25 and see if the PLCB can redeem itself with a better showing in any way at all. I'm guessing they may have 2 maybe 3 of the 15. In what must be incredible piece of luck for PA wine drinkers the state actually lists this item and has 22 cases in the entire state and only at list price! I'm amazed! Can they really improve to 2 out of 10 when the #1 wine is announced tomorrow and is a .200 batting average enough to keep them from being sent back to the bush leagues? We'll find out! By all accounts, the PLCB had a good sales year. Well, hurray. It's nothing to brag about -- though they will, and have -- since they are the only game in town. The population grows (slowly, but it grows), the economy gets better, and people spend more money on booze. It isn't because the PLCB is doing a good job; it is because the citizens have no other choice. 1. License fees returned to local municipalities $ 4,521,545 -- If the PLCB didn't get in the middle, local communities would get this revenue as a regular stream when businesses paid for their licenses TO THE LOCAL COMMUNITIES. 2. Philadelphia and Allegheny counties received $8,269,803 in returned local sales taxes. 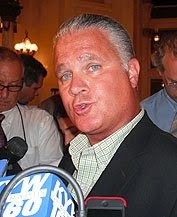 -- Again, if the PLCB wasn't in the middle, the taxes would be collected and distributed anyway. It must be nice to crow about following the law...except, of course, when it comes to trips and gifts for senior level PLCB employees. 3. Paid Total Annual Rent of $42,034,434 for 606 stores. -- This begs the question of how much rent would be paid if there were 2400 or so private stores? 2400 stores is about what the national average is for a population of almost 13 million. 5. Updated the Fine Wine and Good Spirits eCommerce site with 'complete and accurate product names,' product descriptions and standardized acronyms. -- Really? From the people who completely cocked up the beer registration list just a few years ago? Let's look at just a couple easily-found examples. Jack Daniel's Tennessee Whiskey has one listed in the bourbon section "Jack Daniel's 1St Edition Straight Bourbon Master Distiller Collection" Which only exists in the mind of some PLCB employee since Jack Daniel doesn't label ANY of its whiskeys as "bourbon." Not one. All the others are listed in the Whiskey section as they should be, except for one that is in the Blended Whiskey section; but Jack doesn't do blended whiskey either. I will give them credit though: it only took them 80 years to finally learn how to spell "Jack Daniel's" correctly. I pointed out mistakes on that as recently as this past spring. 6. Also restructured the website search engine to allow searches using misspelled words, abbreviations, and synonyms producing much improved search results for customers. -- Let's see how that works. Sticking with Jack Daniel's type in Jack Danial's into the search box. You only misspelled it by one letter putting an "a" instead of an "e" in Danial's. The result.....a page and a half of Calico Jack rum first, but JD does show up on page 2. How about we just forget the "'s" and put in Jack Daniel into the search box. Again a page and a half of Calico Jack rum and then the JD on page 2. An improvement! ...until you realize that if you spell Jack Daniel's correctly and search for it, you still get a page and a half of Calico Jack rum first! The trick, apparently, is to just put in Daniel's, and you'll get all the JD listings. Just don't misspell it or forget the "s" or the apostrophe, because then you get nothing contrary to what the PLCB says. Not quite ready for prime time and certainly not a product a $2 billion company should be proud of. I can find a lot more but let's look at some money. Sales on the captive Pennsylvania population did go up 3.2%, which is to be expected, given that the state has a monopoly and overall spirits and wine sales were up nationally. But Gross Profit only went up 3%...and Net Income (which in a 'real' business would be called 'Profit') went down by 3.6%! Wondering why? Here's a clue: operating expenses went up 5.2% (which is a lot, considering what it bought them, as we'll see in a bit). Operating income went down, even though the much-ballyhooed 'bailment' is in effect (where the PLCB doesn't pay for a product until it leaves the warehouse). Contributions to the BLCE went up 4.1 %, but BLCE enforcement of border bleed is at the lowest it has ever been. Oddly, during this record alcohol sales year, the amount that went to Drug and Alcohol programs went down 3.6%, which seems a little contradictory, given the 'control' mission of the PLCB. Don't overlook another big one: Return on Assets (usually called Return on Investment) went down 14.8%! ROA gives an idea as to how efficient management is at using its assets to generate earnings. Also, even though there was only 1 more store than last year, wages as a percent of sales increased an astounding 18.3%, which is not a good indicator of efficiency either. Of course, a real business has to list all their debts on their reports to shareholders...and I don't see the over $600 million that is the PLCB share of the pension debt listed anywhere. Maybe it doesn't count since the taxpayers and not the PLCB have to cover it. Like any business with a PR department, the PLCB tries to put on its happy face when reporting on what a super duper job they are doing, but the end result is still less selection, less convenience, higher prices, no real increase in safety, and certainly more aggravation for the consumer than in states with a privately-run liquor retail and wholesale industry. One only has to travel to see that for yourself. The Wine Spectator Top 10 list started to come out the other day, and this is another place where the people of PA can see in so many ways that they are not treated as most other citizens are when it comes to having the best available. Compared to some limited editions, bottlings of eight thousand cases is a lot of product. So where were those 'world class' apron-wearing cube rat selectors the PLCB has in Harrisburg when the advances on these wines came out? I'm guessing not reading the Wine Spectator, even though they get free copies. Since PA is the 2nd largest wine buyer in the country not getting an allocation of the #5 wine on the list shows that the distributor thinks that is isn't worth their time to deal with the PLCB or the buyers didn't try to get it or the system we have isn't as "world class" as they say. Most likely a combination of all of that. You can buy it in New Jersey or New York still if you want from a private seller who somehow manages to know what fine wine and good spirits really are. Six in a row not available in PA, let's see how they do in Part 4 when wines #2, #3 and #4 are released on Thursday. Will the PLCB continue the losing streak we have come to expect of will they have made a mistake and actually gotten something exceptional . Any takers? Any bets? Compared to some limited editions, bottlings of six thousand cases is a lot of product. So where were those 'world class' apron-wearing cube rat selectors the PLCB has in Harrisburg when the advances on these wines came out? I'm guessing not reading the Wine Spectator, even though they get free copies. I can almost forgive them for not having the Brewer-Clifton but with the (ahem) world class non-certified buyers and the supposed buying power of the state almost doesn't cut it. Four in a row not available in PA, let's see how they do in Part 3 when wines #5 and 6 are released on Wednesday. Any bets? The Wine Spectator Top 10 list started to come out yesterday, and this is another place where the people of PA can see in so many ways that they are not treated as most other citizens are when it comes to having the best available. Compared to some limited editions, bottlings of eight and ten thousand cases is a lot of product. So where were those 'world class' apron-wearing cube rat selectors the PLCB has in Harrisburg when the advances on these wines came out? I'm guessing not reading the Wine Spectator, even though they get free copies. Let's see how they do in Part 2 when wines #7 and 8 are released on Tuesday. Any bets? PLCB - We only like Veterans sometimes...depends on the place and time. 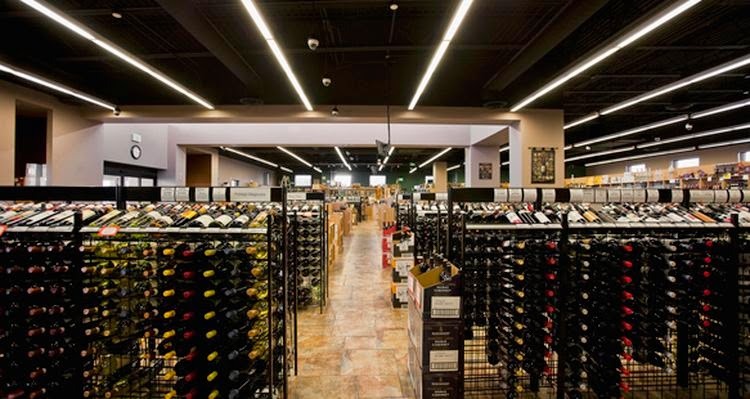 While most Fine Wine and Good Spirits stores will be open per their regularly scheduled hours, some will have alternate hours or remain closed on Veterans’ Day. Please call ahead. 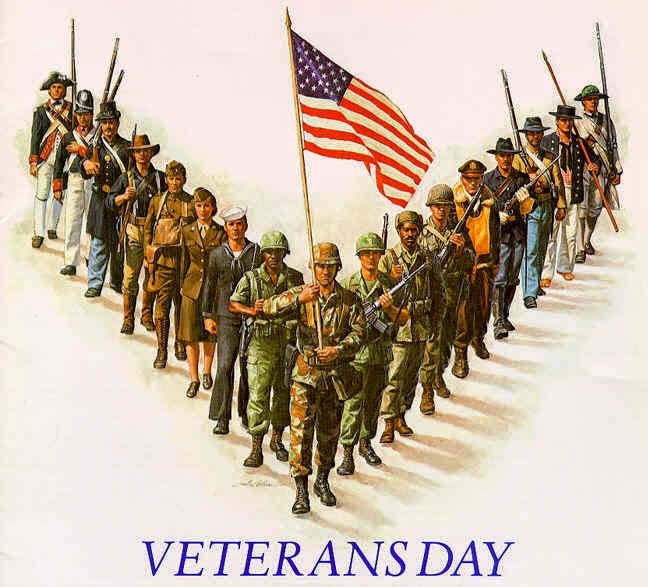 Without Vets you wouldn't be open any other day. Support your Veterans. Shop in states that allow you the freedom that they protected and not socialism of the state store system; and tell the new governor: abolish the State Stores, rewrite the Code. Springfield and Philly. What a difference not having the PLCB makes! Springfield Mo., "the queen city of the Ozarks." Population 167,000 with an MSA (Metropolitan Statistical Area) of a whopping 450,000. Philadelphia, "the city of brotherly love" (and those who buy their booze across borders). Population 1,526,000 with an MSA of 6 million. Why am I comparing these two places? They both have a whiskey festival, although technically the one in PA is called the Whiskey and Fine Spirits Festival. "Fine Spirits" apparently includes things like Smirnoff Sorbet Light Peach and Ole Smoky Moonshine Hunch Punch, according to the masters of the mundane in Harrisburg. So what do you get for your VIP dollars in PA? A chance to taste 304 spirits (really only 292, because some are listed twice!) of which about half (151) are something I would call whiskey or whisky. In Springfield you get at least 200 whiskies and none are called Hunch Punch. You can look for yourself. Here is Philly, and here is Springfield. Not even close, which just shows the sad state that the PLCB is in. If a magazine can sponsor and put together a pretty good whiskey festival in a town the size of Springfield, but the 3rd largest retailer of spirits has to scrape the bottom of the barrel and still falls short, that speaks volumes about how well the PLCB serves the citizens, and what the industry thinks of our backwards system. Yes, I know the Philly Festival is sponsored by a magazine too but they can't do it without the expressed approval and participation of the PLCB. Look at all the spirits PA doesn't carry. Must be 100 of them -- but they all are available in the free market. Of course, a number of things at the Philly Festival aren't available in PA either, which means if you really want some, you'll have to break the law to get it. All courtesy of the PLCB, who approved all of this. Even the highlights mentioned by the PLCB are laughable. There are only three, and two are for items you can't get. I especially like that Stranahan's Colorado Whiskey will be offered for tasting. It isn't carried at all by the PLCB, so the entire state is missing out on some pretty good whiskey. You can't get it if you did like it anyway. I guess they think the drive to State Line Liquors in MD is close enough. Which brings up the question: why even have this at the festival if the PLCB doesn't carry it? If you have no chance of buying some of the things they are offering, what's the point? It really does show how limiting and ignorant the people in Harrisburg are. Face it, the PLCB is the reason why we can't even have a half-assed whiskey festival. People that do real festivals laugh at the PLCB and us the same way we laugh at somebody trying to buy a six pack at a distributor. You know that is the way it should be done, but somehow in PA it is never done right. If you want to go to one of these things, plan a trip. There are numerous festivals in the US, far better than the PLCB ones in Philly and Pittsburgh, plus you have a chance to actually buy the products you taste and give your money to somebody that cares about the consumer. DC, New York, Boston Vegas, Nashville, LA, Bardstown, Atlanta, and more As a consumer you deserve the best, so why support the worst? The Free Market is the only real Modernization. You would think that Pennsylvania with over 4 times the population would have stores that any large U.S. city would claim. Small boutique stores in trendy urban areas, Specialty stores with unique selections picked out by knowledgeable owners, Mega stores with 30,000 square feet of retail space and 10,000 products in stock. Pennsylvania has none of that. In fact, the Commonwealth has fewer stores per capita than Utah, and even less when you look at the number of stores per drinking age population. Here is a store in Heber Utah,, population 12,900, that if transported to anywhere in PA would be the 2nd largest store in the state. That is only because the PLCB has opened ONE in the entire state that is larger and that happened only a few months ago. Is it a fluke? Something they did to to show off? I mean, doesn't PA have thriving metropolises of 13,000 people or MORE that could use a store like this? Not according to the PLCB. Their cookie cutter approach means that even places that could support specialty stores, Mega stores and boutique stores don't get them. The PLCB doesn't know how to run them, staff them or even sell in them. Our system is so backasswards that "modernization" actually results in LESS products available in a given store size. Why doesn't Philly or Pittsburgh or Scranton or Harrisburg or Erie rate a store like Utah has in Hurricane (population 13,700). A store that is bigger than anything in PA...how's that work? Does their DABC actually pay attention to consumer demand? Are they run by actual business people and not political hacks? (Not really, their board is as hackneyed as ours) Is it because they have an advisory committee of real business owners, brewers, restauranteurs and health professionals? My guess is that they are actually more competent across the board and are held more accountable then the people who run the PA state store system. You don't see DABC officials being cited for graft or nepotism or coming up with wine kiosks, or failed "store in a store" ideas. In another state, New Hampshire just opened two 20,000 square foot stores both larger than anything in PA. We know what a thriving business they have since people actually go to their state stores rather than away from them like in Pennsylvania. In just over 2 years Washington now has over 40 stores larger than anything in PA. That's what happens when you pay attention to consumer demand. We get wine kiosks. While nobody should suffer under the limitations of states monopolizing what should be privately-owned and run retail...the question is, why do Pennsylvania residents have to be at the bottom? Let's look at another failed concept by the PLCB. Although they won't admit it is a failure, when nothing you want comes out of a program it is a failure. Here we have the epitome of customer convenience in the eyes of the PLCB. Read and then wonder why they ever thought it would work. Two years ago, in October 2012, the PLCB came up with an eight year plan called "Convenience 2020." This plan was to put a "One Stop Shop" inside a grocery store that already had twisted themselves around to comply with the PLCB regs and then had to overpay to get an "R" license in order to sell beer. A match made in heaven, since the stores already hate the PLCB for making them go through the added expense and effort of what is a relatively easy process elsewhere. Is the PLCB, since they "interpret" the liquor code to whatever they feel like on any given day, going to somehow put the liquor and the beer in the same area since the age requirements for purchasing are the same? Of course not! This is the PLCB: convenience is a foreign concept to them. They only go through the motions, because otherwise they would have been privatized decades ago. In this Pennsylvania nightmare you get your cart, shop for groceries and then make a choice. You can either pay for your groceries and take them out to your car and then come back for your beer; or buy your beer first, and then go shop for and buy groceries...at a different set of registers. BUT WAIT! You forgot the wine. Now you can go get the wine first because your cart won't fit in the liquor store, pay for it there, then go grocery shopping pay for those, take everything to the car and then come back for beer (or buy the beer pay for it at the beer register and then pay for the groceries). And just think: if it's a hot day, you can leave the wine in the car and have it get heated up just like in the PLCB's trailers! The epitome of convenience! You get to pay at three different registers inside the same store. And they wonder why it isn't working out. What does it take to wake up the PA Senate? Something for all the Democratic and RINO senators to think about as they prepare once again to avoid voting for what the plurality if not majority of people want: privatization and de-monopolization of the sales of spirits, wine, and beer. Privatization does not increase underage drinking. According to the U.S. Department of Health and Human Services, 29 percent of those ages 12-20 consumed alcohol in Pennsylvania. Compare this to states that have far less government control such as West Virginia (which is also a control state for wholesale) and the number decreases to 24 percent. In fact, the United States average is 27 percent. If government controlled liquor is effective in curbing underage drinking, why are we 2 percentage points higher than the national average and higher than almost all our neighboring states? Why is our underage DUI fatality rate higher than all but one border state? Privatization does not cause more drunk driving, cause more alcohol related accidents or more alcohol related fatalities. Pennsylvania is once again barely average or worse. 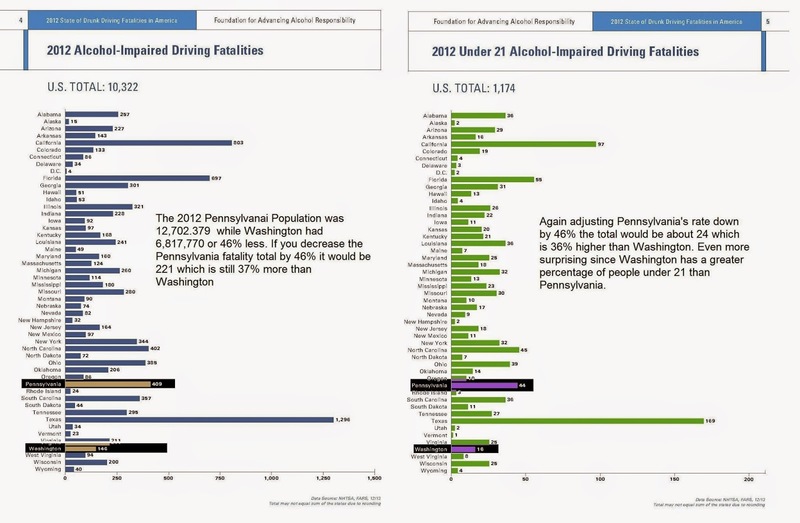 In alcohol related traffic fatalities in 2012, Pennsylvania was at the national average of 3.3 per 100,000. If the current government monopoly is better suited for curbing drunk driving, why are we not ahead of the national curve? Furthermore, MADD ranks the states in order of DUI-related accidents per capita. Pennsylvania ranked 35th best – lower than New York, New Jersey, New Hampshire, West Virginia, Virginia, and Ohio. Obviously the median here is 25; Pennsylvania being 10 states away. In 2010 overall alcohol related deaths, Pennsylvania is also surpasses neighboring states. Pennsylvania reported 26 per 100,000 residents. Compare this to 24 in Delaware, 22 in Maryland, 20 in New Jersey, 20 in New Work, and 25 in Ohio. In the 2 years since Washington privatized DUI fatalities have decreased at a far faster than in Pennsylvania even though they started at a lower rate. You now have a 36% less chance of being killed due to an alcohol related accident in Washington compared to Pennsylvania. Privatization increases employment. As President Ronald Reagan used to say, “The best social program is a job.” The labor union UFCW 1776 will tell you that privatization kills jobs, but they are wrong. 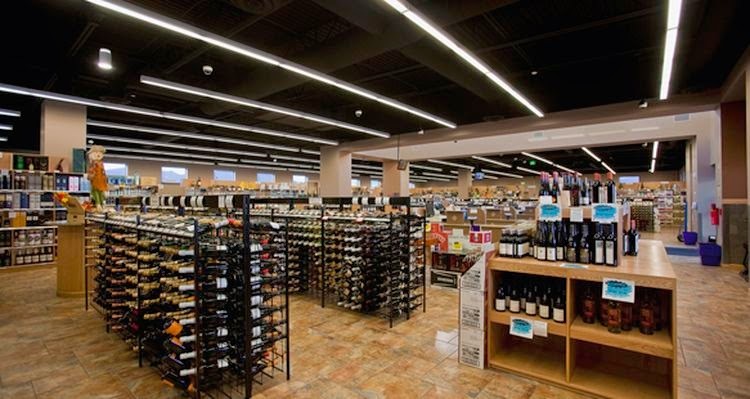 More than doubling or even tripling the amount of outlets for wine and spirits can only mean more jobs. It’s common sense. If anything, the UFCW saying there won’t be jobs for their members is tantamount to saying they don’t believe their members are employable in the private sector. Every locale that has privatized has seen an increase in employment. New warehouse jobs, new delivery jobs, new store jobs. Places that fully privatized tripled employment in the industry. The ability for these employees to use their previous knowledge to specialize in this new industry could actually increase their earning power. Privatization will increase revenue. A 2010 study commissioned by the Wine and Spirits Wholesalers of America found that 23.6 percent of the wine purchased by consumers in Pennsylvania comes from out of state, resulting in the loss of $17.3 million in excise taxes. A more recent study conducted for the PLCB showed that 45 percent of residents in Philadelphia and its surrounding counties purchase some or all of their alcohol outside of Pennsylvania. The PLCB's own numbers showed that consumers purchased approximately a quarter of their wine and spirits in other states. This border bleed equals more than $180 million in lost sales, and more than $40 million in lost state tax revenue annually from just a handful of counties. These are lost dollars that could fund programs that are essential to our Commonwealth, but that are instead funding Delaware, Maryland, New York, and other border states with lower prices and increased selection. Decreasing border bleed through price competition, increased convenience, one-stop shopping and increased selection will increase taxes collected. Increased sales will increase taxes collected. Business will pay taxes the current system doesn’t. More people working will pay taxes. More people working means more sales across the Commonwealth for everything which also means more total taxes collected. Privatization will remove the inherent conflicting interests of PLCB sales and enforcement. Quite simply, our current system is a house divided. The same entity charged with licensing vendors and enforcing liquor laws is marketing, selling, and producing alcohol...in direct competition with the private companies it regulates (with a surprising lack of consistency). Under privatization, penalties and fines could become much stricter as the PLCB’s conflicted mission would be resolved. In the new, fully privatized system, the PLCB would license, enforce, and educate; which is the appropriate role of government. The troika of party hacks who make the arbitrary and often inconsistent rulings on licensees' questions about application of the Liquor Code could be replaced by experienced regulators, lawyers who do nothing but apply the Code, full-time. The agency would then be run by a director, not a jumped-up "CEO". Privatization can renew the people’s faith in their government. Distributing and selling liquor should not be in the hands of a state-run monopoly, which is clearly not a core function of government. There has never been a poll that has been in favor of the state run system. Historically, 40 years of polling show the citizens want a change and that change is to a free market system they see working far better in neighboring states. The lack of reform in the face of overwhelming public support leads citizens to conclude that state government is distant, unresponsive to their wishes, and captive to selfish interests. By responding to the will of citizens and consumers, lawmakers can show that Pennsylvania state government listens and responds to the will of the people they are elected to serve.